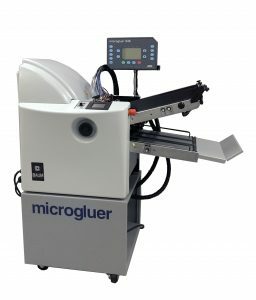 The microgluerXA® is a complete all in one fully automated folding and gluing machine. This unique and highly productive folder gluer is designed to produce self-mailers in half fold and letter fold formats. The XA’s automated fold plates, viable speed stacker and vacuum assisted feeder simplifies make ready, saving time and money. Available in 2, 4, and 6 gun configurations, the microgluerXA® is the right choice for companies focused on quality and throughput.